Welcome to the latest edition of Friday in the Sun, your latest and sometimes greatest roundup and collection of gossip, news and rumors from the Alaska political world. As always, take everything with a flake or three of salt. That’s the final day (tomorrow) to request a by-mail absentee ballot from the state of Alaska for the Aug. 21 primary. Applications must be received by the state by the end of the day tomorrow, with official office hours between 10 a.m. and 4 p.m. on Saturday. You can return applications in-person, by fax or email. Early voting began on Monday, and in-person early voting will be available through election day. You can find the locations here. If you need a reason to vote, keep reading. Gov. Bill Walker was mentioned in an Associated Press story this week about how some candidates are shying away from a political action committee that’s specifically backing independents. Unite America, which gets flack in the article for fighting “dark money” with “dark money” (though the truly “dark money” is reportedly not what’s going to the independent expenditures but its non-profit arms that have paid for legislative staffers in other states), has endorsed Walker. The donor list for its political independent expenditures warchest includes a $285,000 contribution video game company Riot Games co-founder Marc Merrill (Riot Games is the company behind “League of Legends” and is currently mired in its own controversy). The AP article doesn’t specifically say whether or not Walker would be on the receiving end of Unite America’s $3 million, but that’s pretty much the point of the endorsements. The group Unite America also isn’t new to Alaska politics. It made Alaska headlines earlier this year under its former name, the Centrist Project, when it hosted a D.C. conference earlier this year drawing the attendance of both Walker and independent Rep. Jason Grenn. Alaska, where only about four in 10 voters are registered Republicans or Democrats, loomed large on the independent-minded group’s radar. “Alaska is certainly one of the states we’re giving a good look at,” Nick Troiano, the group’s executive director, told the ADN at the time. Alaska’s candidates must have made the cut. In addition to endorsing both Walker and Grenn in this year’s elections, the group has also thrown endorsements behind independent Rep. Dan Ortiz, and newly minted independent Rep. Paul Seaton (Seaton dropped his Republican label earlier this year and threw in as an nonpartisan candidate in the Democratic Party’s primary). We’ve been following independent expenditure spending closely, and have yet to see Unite America make any spends in Alaska. Stay tuned. Speaking of Rep. Ortiz, his Republican opponent, Ketchikan School Board President Trevor Shaw, is facing a recall petition that could be on the October municipal ballot (which would be after the deadline to withdraw and replace a general election candidate). The folks behind the recall effort need 540 verified signatures to get on the ballot and turned in 700 this week. The recall complaint had to be narrowed down from a whole bunch of accusations and is based on the accusation that Shaw “chose to verbally and physically … dismiss a student representative’s request to be heard,” according to a report by KRBD. The city clerks aren’t in the role of fact-checking the claim, but say the claim meets the criteria for a recall effort (which would be violating board bylaws). They also hope to get through the verification process sometime today. At the very least, the folks behind the recall petition know their stuff a fair bit better than the folks that filed a recall petition against Rep. Jason Grenn with the Anchorage municipal clerks. 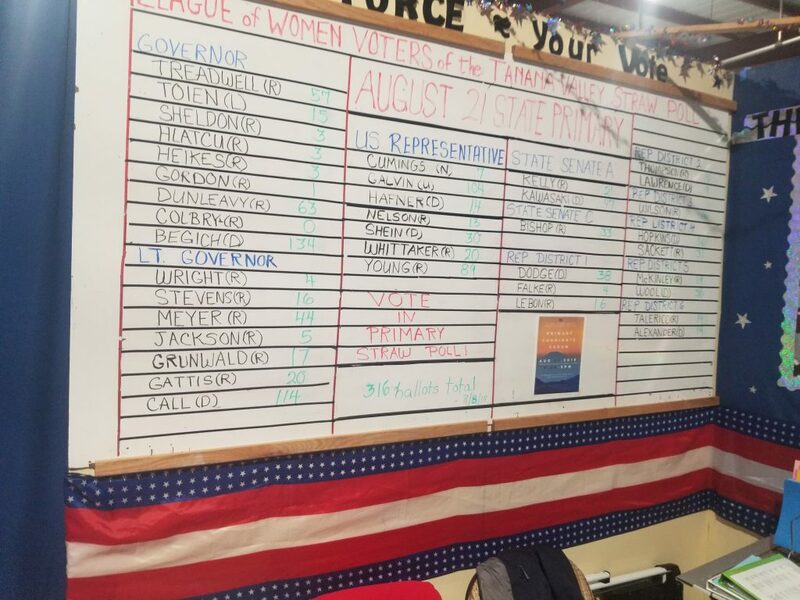 Besides the Costco membership drive booth, the League of Women Voters of the Tanana Valley was getting plenty of attention at the Tanana Valley State Fair up in Fairbanks this week. Things were certainly going well for Democrats across the board (Kawasaki was up more than 2:1 over Kelly and same went for Begich over Dunleavy) with 316 ballots cast at the booth when I stopped by Thursday night. Though because it’s a primary ballot, Walker wasn’t there and you were limited to voting for the candidates on whichever ballot you took. Speaking of Fairbanks elections, we’ve heard rumblings that there might be some local polling circulating that might not be too far off what we saw above. Progressive candidate Austin Quinn-Davidson racked up an enormous margin of victory in Tuesday’s special election voting to secure a seat on the Anchorage Assembly running through the April 2020 elections. According to the Thursday’s vote tallies, Quinn-Davidson holds a nearly 20-point margin over conservative Nikki Rose. It’s a big victory for many reasons, but great news to the many other progressive women who have decided to enter the political realm in what’s shaping up to be a great year for them. Just this year, the Alaska Legislature reached the highest number of female legislators with the appointment of Rep. Tiffany Zulkosky. And coming up, a slate of three progressive women running for the Fairbanks North Star Borough Assembly could bring the assembly the closest to matching the gender demographics of the borough in its 50-plus year history. The local election season is still taking shape, and the filing deadline for Juneau’s local races runs through Monday. Checking in on the letters of intent, we saw Juneau resident and twitterer Carole Triem has filed her letter of intent with APOC for municipal office. Women are also organizing and mobilizing in the statewide races, too. Down in Anchorage, Democratic candidates for the House Liz Snyder and Amber Lee are holding a fundraiser with congressional candidate Alyse Galvin later this month (after the primary, so Galvin has to be pretty confident). Multiple people sent us this Facebook post by Republican Stephen Duplantis, who’s challenging Rep. Chuck Kopp (who’s in the top 10 of our much-misunderstood legislator ranking (it was never meant to be scientific, people!)) in the Republican primary. 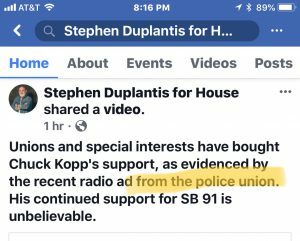 The big problem with the claim about this ad is that it was allegedly paid for by the police unions–which it wasn’t, it was paid for by firefighter unions–and it also seems to suggest that the police union is on board with Senate Bill 91–which they aren’t. Oof. With the primary election less than two weeks away, the battle at the top of the GOP ticket is just about as exciting as the WWE Summerslam main-event rematch between Brock Lesnar and Roman Reigns that’ll take place just two days prior. In both cases, we all have a good idea about who the winner will be (though there’s always that slim chance of a last-minute swerve). Instead, we’ll all be looking to the mid-card for the entertainment and this year’s field of Republican also-rans is, well, particularly… something. While Mead and Mike were praising the importance of education and the University of Alaska system, the mid-card was none-too-happy with those damn, public schools. Merica Hlatcu didn’t make quite as big of a splash as his fellow candidates and name first-name might suggest, but he did propose instituting a five-year residency requirement to begin to receive the PFD, suggesting that the current one calendar year attracted too many leeches to the public welfare system. The Fairbanks Daily News-Miner’s annual candidate survey special section will be out this weekend, but one avid reader saw that part of it was posted early and, hooboy, it’ll certainly be worth checking out. We won’t spoil the whole thing, but suffice it to say one of the GOP mid-carder’s answer to sexual harassment in the Legislature will be to make sure a man is present in all meetings to act as chaperone and judge of any potential sexual harassment claims. A whole mess of education-related bills were signed today during a teacher in-service in Fairbanks. Though it’s pretty much the norm for politicians off all stripes to show up for signings regardless of how involved they were in said bill, the whole thing came off as a little unsightly–and a little campaign-y—to many teachers who were there. One reader asked about our report on independent expenditure spending targeting this year’s races, noting that there’s a heckuva lot of Canadian-owned mines that are spending big on opposing the Stand for Salmon initiative. The reader wondered how that’s legal. Well, folks, we mostly have Citizens’ United to thank for that. Those foreign-owned companies are allowed to pour as much money as they want into elections as long there’s a subsidiary registered in the U.S. and the spending is made by American citizens. Cool. It’s an issue that the now-defunct per diem initiative had hoped to target when it came to foreign-owned companies spending on candidate races. That provision was largely neutered in the version of House Bill 44, which knocked the initiative off the ballot, because it simply aligns the ban with the permissible federal rules. That’s what someone asked at the Thursday night debate for Republican candidates for governor and lieutenant governor during a question about whether or not any had ever lived in rural Alaska (the candidates also had to get an explanation of what “roo-ral” Alaska was), according to this clip of Thursday night’s debate by ADN reporter Tegan Hanlon. Juneau comics shop owner and all-around cool guy Pat Race helped make this year’s election voter pamphlets particularly memorable with a bunch of animated covers specific to each region, along with custom stickers. The NRA released its endorsements for this year’s elections, making it one of the handiest voting guides for both liberals and conservatives. Like the survey put out by Alaska Family Action, plenty of folks skip this one over (like every Democratic candidate for the progressive House District 20 seat). The list of endorsements goes as follows: Don Young for the Republican nomination for Congress, Rep. Chris Birch in the GOP primary for Senate M, Sen. Peter Micciche in the GOP primary for Senate O. The House candidate endorsements are as follows (they’re all in Republican primaries): Rep. Mark Neuman for HD 8, Rep. George Rauscher for HD 9, Rep. DeLena Johnson for HD 11, Kelly Merrick for HD 15, Rep. Chuck Kopp for HD 24, Rep. Charisse Millett for HD 25 and Rep. Lance Pruitt for HD 27. The pro-gun, Russia-tainted organization skipped over endorsements for governor and lieutenant governor, as well as the Senate race between Reps. Lora Reinbold and Dan Saddler. Be the first to comment on "Friday in the Sun (Aug. 10): The ‘I’m Not a Marshmallow’ edition"